After months of speculation, the plans for Elon Musk's Hyperloop Alpha finally hit the web this afternoon. What's this thing really about, anyway? Here's what we now know so far. The Hyperloop Alpha technical document was posted on Tesla Motors' website moments ago. While we're still combing through it all, here are some of the highlights. So it's a big underground tunnel? No, contrary to some earlier guesses, the Hyperloop won't go underground. It's also a tube system, not a rail system, and it's built on pylons built in prefabricated sections that are dropped in place. It's cheaper and safer this way, Musk says. A ground based high speed rail system by comparison needs up to a 100 ft wide swath of dedicated land to build up foundations for both directions, forcing people to travel for several miles just to get to the other side of their property. It is also noisy, with nothing to contain the sound, and needs unsightly protective fencing to prevent animals, people or vehicles from getting on to the track. Risk of derailment is also not to be taken lightly, as demonstrated by several recent fatal train accidents. So it's like a train but not on rails? Right, it runs on a cushion of air and propels itself through a tube that has lower air pressure, like a vacuum. Why hasn't anyone attempted this before? The big physical limitation is something called the Kantrowitz Limit, which it overcomes with that big compressor out front. If it's a near-vacuum (or at least very low pressure) how will people breathe? The cabins will be pressurized. It'll be limited, for various safety and physics-related reasons, to about 700 mph, which will allow you to travel from LA to SF (or vice versa) in about 30 minutes. What if I have to use the restroom? Since you're in a small pod with other people (think car-sized, not plane-sized) you're just going to have to hold it. Won't I feel sick or be squished like a bug? No, just like being in a plane it's all about acceleration and deceleration, which Musk claims will be more gradual (less than .5gs at any point, roughly a car under medium braking). There's also very little lateral (side-to-side) movement which, when you fly, is what usually makes people feel ill. But Elon Musk Isn't Building It? That's why the plans will be open source, so anyone can modify or improve upon them. Musk himself conceded he's too busy with Tesla and SpaceX to build it. Can I take it to from San Francisco To New York? At least for now, the Hyperloop seems to be more a system of linking cities that are relatively close together, rather than a new national rail system. While it's potentially great for linking cities like Los Angeles and San Francisco, at distances beyond that, air travel is probably cheaper. Is This Elon Musk&apos;s Hyperloop? The Hyperloop (or something similar) is, in my opinion, the right solution for the specific case of high traffic city pairs that are less than about 1500 km or 900 miles apart. Around that inflection point, I suspect that supersonic air travel ends up being faster and cheaper... For much longer journeys, such as LA to NY, it would be worth exploring super high speeds and this is probably technically feasible, but, as mentioned above, I believe the economics would probably favor a supersonic plane. About $6 billion, projected, for a system thats passengers only. A system that can also incorporate cars would be about $7.5 billion, but some of these costs seem a little understated (like getting land). Why is the tube so expensive? The pods and linear motors are relatively minor expenses compared to the tube itself – several hundred million dollars at most, compared with several billion dollars for the tube. Even several billion is a low number when compared with several tens of billion proposed for the track of the California rail project. But what about earthquakes? Won't everyone die in the tube? Here's something it has in common with your car: dampers that contend with shifts and changes in the ground below. By building a system on pylons, where the tube is not rigidly fixed at any point, you can dramatically mitigate Earthquake risk and avoid the need for expansion joints. Tucked away inside each pylon, you could place two adjustable lateral (XY) dampers and one vertical (Z) damper. These would absorb the small length changes between pylons due to thermal changes, as well as long form subtle height changes. As land slowly settles to a new position over time, the damper neutral position can be adjusted accordingly. A telescoping tube, similar to the boxy ones used to access airplanes at airports would be needed at the end stations to address the cumulative length change of the tube. Is this more or less energy efficient than a train? The Hyperloop doesn't just run on power, it can potentially put power back into the grid thanks to solar panels and the onboard fan. ...by placing solar panels on top of the tube, the Hyperloop can generate far in excess of the energy needed to operate. This takes into account storing enough energy in battery packs to operate at night and for periods of extended cloudy weather. The energy could also be stored in the form of compressed air that then runs an electric fan in reverse to generate energy, as demonstrated by LightSail. 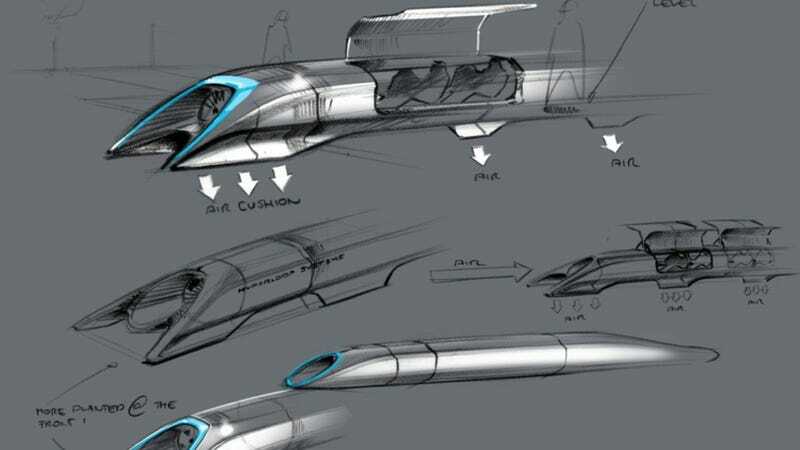 How long before someone builds a Hyperloop? Musk has made a career of defying people's expectations, but I wouldn't hold my breath.